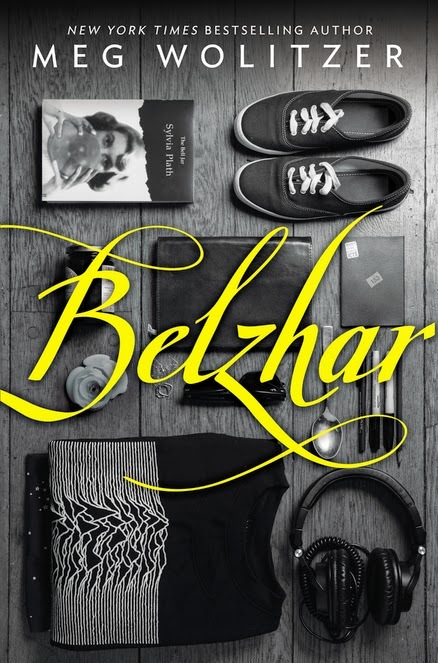 Belzhar by Meg Wolitzer. Dutton Children's Books. 2014. The Plot: Jam Gallahue was in love with Reese Marfield and it was wonderful and magical and all that made life living. A year that has passed since she lost Reese, a year of life not being worth living, a year of Jam barely able to leave her bedroom, shattered by his death. So Jam's parents have done the only thing they can think of: sending her away from her New Jersey home and all the memories, to go to The Wooden Barn, a boarding school in Vermont for those who are "emotionally fragile, highly intelligent." Jam isn't happy to be there, but then she finds herself in a unique seminar: "Special Topics in English," with five students intensely studying one author for a semester. This year, the author is Sylvia Plath. Each student is given a journal, to write in. And when Jam puts pen to paper ... something magical happens. She finds herself in a place where time stands still, and Reeve is hers again. As the semester draws to a close, Jam wonders what will happen when she reaches the last page. Will she figure out a way to stay with Reese? Should she? The Good: Another one of those books that I love, but part of what I love is the twists and turns and the reveals. It's not just the secrets: it's finding out the secrets. Jam is at a school for the "emotionally fragile," so everyone has some type of story Hers is Reeve. Her fellow Special Topics members (Sierra, Marc, Griffin, Casey) each has had a loss; each, it turns out, can also use their journals to return to that pre-loss time. Inspired by the title of Plath's novel, The Bell Jar, they call the place they go to Belzhar. Jam's whirlwind romance with Reeve was meaningful and magical but short: only 41 days. Actually, that is the sum total of the days they knew each other. It was sixteen days before they kissed. So Jam has only a handful of memories stored up and what she finds is in that Belzhar, she is limited to experiencing only what actually happened. Oh, it's not as if she's stepping back in time: Reeve understands that something is happening, something outside time almost, and impatiently worries about the times she isn't with him. And... I don't want to get into spoilers, about Jam and her friends, or about Jam and Belzhar, and what it is or is not. But wowza; there was a certain deliciousness in reading and figuring out and discovering, much like there was with We Were Liars (but for different reasons.) Belzhar is not just about "emotionally fragile" people, but it's what it means to be emotionally fragile and how that shapes how you see the world and how you act in it. And aside from that, it's about the stories we tell ourselves about ourselves, much like The Bell Jar itself is Plath telling her story in a certain way. And, of course, the language! This, for example -- "to be on the verge of your life, and not to be able to enter it" is just such a good description of someone being held back and knowing they are held back, for whatever reasons. Or this: "Because when I let go of the story I've been telling myself and just try to think about what's objectively true, I can barely get a grip." And how often is that true, also -- the truth being so frightening that we tell ourselves other things we believe to be true, to get through the day. Wolitzer's first novel--Sleepwalking--and her latest--The Interestings--have intriguing connections to this book. Sleepwalking is also unusual in that it was first published as adult, but the paperback edition was YA. Roger, I need to track both of those down. I read SLEEPWALKING when it first came out, but the paperback version, so didn't realize I had because I didn't recognize the cover. Now I want to reread it.